Multiple and contiguous involvement of vertebral bodies, the anterior wedging, antero posterior elongation, associated Schmorl's nodes, end plate irregularity and disc space narrowing. The exaggerated kyphosis of Classical Scheuermann's is absent. Also known as a Scheuermann kyphosis. A common condition resulting in kyphosis of the thoracic or thoracolumbar spine. Low back pain in adolescents, the Schueurmann's disease must be considered. A plain Xray film is sufficient for diagnosis. Incidence : ~ 0.4 to 8% of the general population. Strong hereditary predisposition present (Autosomal dominant). The most common and classical form of Scheuermann's disease occurs in thoracic region. The Lumbar variant of Scheuermann's occurs in lumbar or dorso lumbar region. - Multiple and contigenous involvement of vertebral bodies, at least 3 adjacent vertebrae demonstrating wedging. - Antero posterior elongation of vertebral bodies. - End plates irregularity which are normally flat. 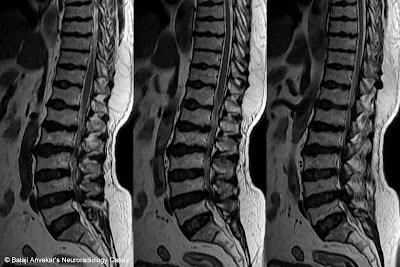 Type I or classic Lumbar Schuermann's shows hallmark wedging deformities of the vertebrae similar to Thoracic Scheuermann's kyphosis. Type II or atypical Lumbar Schuermann's does not have a wedging deformity of the vertebrae. Instead the vertebrae maintain their normal squared shape. Severity of kyphosis is also mild. This variant is known as "acute traumatic intraosseous disc herniation." This is characterized by a history of a traumatic event – usually a fall – and includes a fracture of the bony endplate with disc material herniating into the bone. The true cause of Schuerman's disease is not known. Proposed theories include mechanical compression during growth, acute disc injuries, hormonal variations, and genetic factors as the cause. None is proven. Treatment is symptomatic. Surgery for severe kyphosis. Ali RM, Green DW, Patel TC. Scheuermann's kyphosis. Curr. Opin. Pediatr. 1999;11 (1): 70-5. Lowe TG. Scheuermann disease. J Bone Joint Surg Am. 1990;72 (6): 940-5.